The Year of Tolerance and the visit of Pope Francis are a call to reflect and to act. To reflect on how we treat each other; and to act to combat those who seek to divide and exclude. This is something we must do as individuals, communities and countries. As an individual, I was reminded of the motto of my college at university “Manners makyth man” which is not as some think about etiquette. In modern English it translates that we are defined as individuals by our moral behaviour toward others, not by our position, religion, gender or other factors. As communities, I cannot better the recent words of Her Majesty Queen Elizabeth II at a recent event to mark the 100 years of Sandringham Women’s Institute in the United Kingdom. “The continued emphasis on patience, friendship, a strong community focus, and considering the needs of others, are as important today as they were when the Sandringham Women’s Institute was founded all those years ago. “Of course, every generation faces fresh challenges and opportunities. As Her Majesty’s Ambassador I am proud to represent a vibrant, multicultural and inclusive country where we recognise that our diversity is our greatest strength, but we are humble enough to realise that there is always more we can be doing. I am delighted to be here in Abu Dhabi in a country which champions these same values and whose leadership is proud to stand up and act as a beacon for them across the region and globally. The visit by the pope is a very significant and historic step. It highlights the UAE’s efforts to promote inter-religious dialogue. 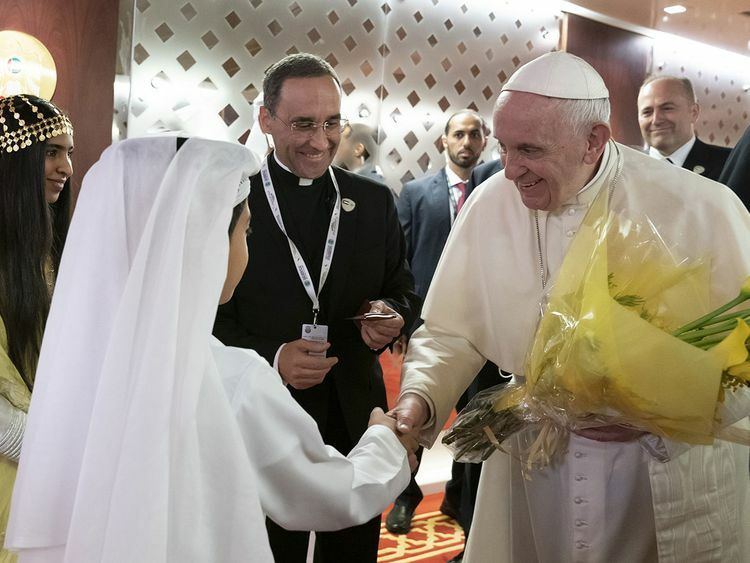 It also showcases the UAE’s own diversity, with many of the hundreds of thousands of Catholics who call the UAE home expected to attend the public Mass. But it is underpinned by commitment and wider actions which draw from the legacy of Shaikh Zayed Bin Sultan Al Nahyan. This was at the heart of the British Council’s UK/UAE 2017 Year of Creative Collaboration programme which included 1,500 British and Emirati artists and cultural professionals. Community and inclusion were key themes of the programme, and many of the events aimed to reach the largest audiences across all demographics of the local community. We were able to showcase work by disabled and marginalised artists and professionals and reach diverse audiences, showing the real impact that performance, instruction and collaborative processes can have in local communities. I was delighted that we were also able to showcase our diversity through events during the 2018 Year of Zayed. Highlights for me include the Festival of Tolerance in November where I joined “Walk Unified” in Umm Al Emarat Park in Abu Dhabi. The theme for the UK’s booth was “Sport is Great”, espousing tolerance through the spirit of teamwork. Naturally we’re now excited to play a full part in the UAE’s Year of Tolerance. It has been a privilege for the UK to work with the UAE on this agenda. As two global hubs where people from all around the world come together to live and work, we are acting together to ensure that is about promoting inclusion and celebrating diversity. That is how we should define ourselves and our future. Patrick Moody is the British Ambassador to the UAE.